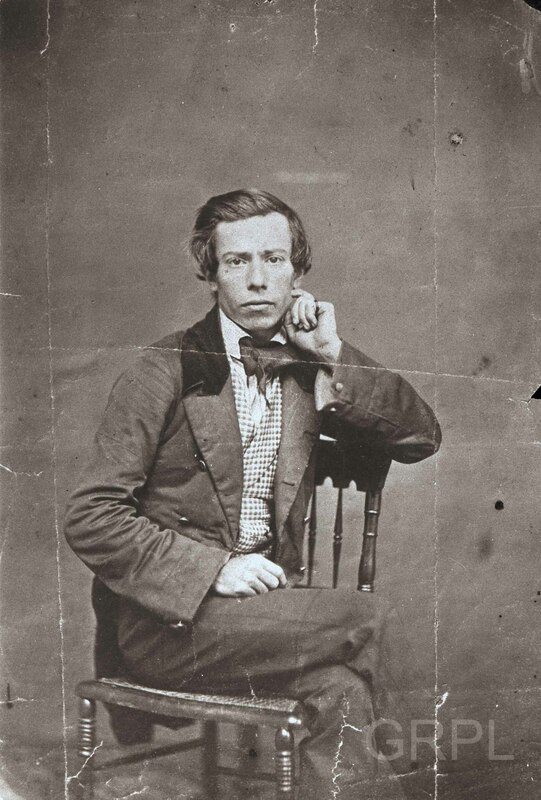 James Minton Keeney, wearing a shirt and tie with a checkered vest and suit jacket with a velvet collar, assumes a casual pose with legs crossed and his left arm resting on the back of a wooden chair that may have a woven cane seat. This is Grand Rapids first 'selfie', taken in the 1850s. Use the magnifer option to look at his left hand, you can see the cord used to click the shutter wrapped around his little finger. Photograph 4 1/2 X 3 1/2 in. Title by cataloger. The image shows crease marks from being folded. It is one of several photographs in Keeney’s personal album.